Earthouse recently worked on a new Tadelakt bathroom in association with Parker SW Ltd. Although it is an ancient plastering material, Tadelakt can create a contemporary look. When applied correctly, Tadelakt creates a waterproof surface meaning it is ideal for bathrooms and wet-rooms, reducing the requirement for tiles and unsightly grouting. It is also superior to regular plaster in bathrooms, which simply soaks up water, causing potential damp issues and mould. View of the Tadelakt bathroom wall.Traditional bathroom tiling has not been used here because it is simply not required. Showers and sinks can be fitted straight onto the Tadelakt walls. Tadelakt can be mixed in a range of colours and shades. On this occasion, a light grey was chosen. This is the largest area we have plastered in Tadelakt and required a lot of polishing. Tadelakt is hand polished with a polishing stone, we use porcelain polishing stones which can be purchased from Mike Wye Associates. Once the Tadelakt has been polished it needs to be sealed. This is a three stage process; initially olive oil soap is used, followed by punic wax and finally carnauba wax. Tadelakt is low maintenance once is has been sealed; it will require re-sealing periodically, but this can be done by the customer as required. It is best to avoid using harsh chemicals on the plaster; soap and water will clean it effectively. 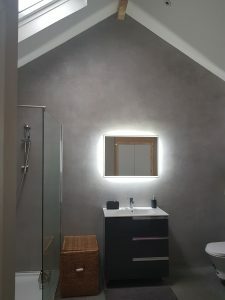 Earthouse can create bespoke bathrooms, wetrooms and feature walls. Due to it’s versatility we can create unique baths, seats and beautiful storage features. Tadelakt is not limited to bathroom usage; it can be used throughout a house, injecting colour and an interesting fresh style. It can also be used externally. For more information, please see our previous post about Tadelakt plastering. If you are interested in creating with Tadelakt, please Contact Us.